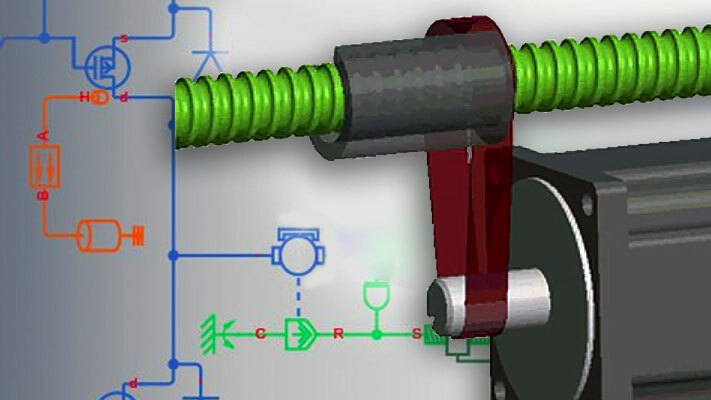 The Local Restriction (2P) block models the pressure drop due to a fixed flow resistance such as an orifice. Ports A and B represent the restriction inlet and outlet. The restriction area, specified in the block dialog box, remains constant during simulation. The restriction consists of a contraction followed by a sudden expansion in flow area. The contraction causes the fluid to accelerate and its pressure to drop. The expansion recovers the lost pressure though only in part, as the flow separates from the wall, losing momentum in the process. m˙A and m˙B are the mass flow rates into the restriction through port A and port B.
ϕA and ϕB are the energy flow rates into the restriction through port A and port B.
uA, uB, and uR are the specific internal energies at port A, at port B, and the restriction aperture. pA, pB, and pR are the pressures at port A, port B, and the restriction aperture. νA, νB, and νR are the specific volumes at port A, port B, and the restriction aperture. wA, wB, and wR are the ideal flow velocities at port A, port B, and the restriction aperture. m˙ideal is the ideal mass flow rate through the restriction. 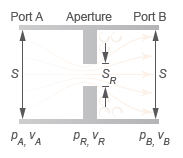 S is the flow area at port A and port B.
SR is the flow area of the restriction aperture. CD is the flow discharge coefficient for the local restriction. in which the subscript in denotes the inlet port and the subscript out the outlet port. Which port serves as the inlet and which serves as the outlet depends on the pressure differential across the restriction. If pressure is greater at port A than at port B, then port A is the inlet; if pressure is greater at port B, then port B is the inlet. in which BLam is the Laminar flow pressure ratio block parameter. The flow is laminar if the pressure drop from port A to port B is below the threshold value; otherwise, the flow is turbulent. To set the priority and initial target values for the block variables prior to simulation, use the Variables tab in the block dialog box (or the Variables section in the block Property Inspector). For more information, see Set Priority and Initial Target for Block Variables. The restriction is adiabatic. It does not exchange heat with its surroundings. Area normal to the flow path at the restriction aperture—the narrow orifice located between the ports. The default value, 0.01 m^2, is the same as the port areas. Area normal to the flow path at the restriction ports. The ports are assumed to be identical in cross-section. The default value, 0.01 m^2, is the same as the restriction aperture area. Ratio of the actual to the theoretical mass flow rate through the restriction. The discharge coefficient is an empirical parameter used to account for non-ideal effects such as those due to restriction geometry. The default value is 0.64. Ratio of the outlet to the inlet port pressure at which the flow regime is assumed to switch from laminar to turbulent. The prevailing flow regime determines the equations used in simulation. The pressure drop across the restriction is linear with respect to the mass flow rate if the flow is laminar and quadratic (with respect to the mass flow rate) if the flow is turbulent. The default value is 0.999. A pair of two-phase fluid conserving ports labeled A and B represent the restriction inlet and outlet.